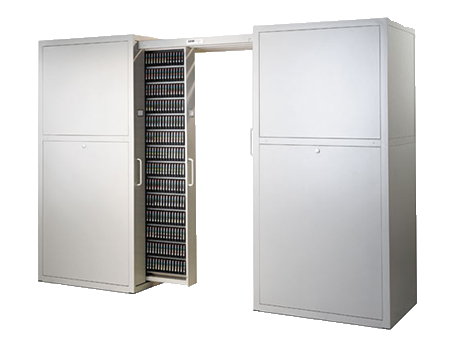 All data and media storage is unique—and with specialized cabinets by Russ Bassett, we help you store it in the best way to preserve its integrity. Some of the many applications we’ve worked with include business offices, libraries, and archival facilities. Spacesaver Intermountain has partnered with Russ Bassett to provide high-density, quick access storage for tapes and media that make the most efficient use of your storage space. Designed specifically to reduce floor space compared to conventional open tape racks, these secure media storage systems can recover up to 70% of the space currently consumed by your tape or media library by eliminating wasted aisles. Consisting of two self-contained cabinets linked by overhead tracks, each Gemtrac cabinet unit holds pullout drawers that open into a center aisle. 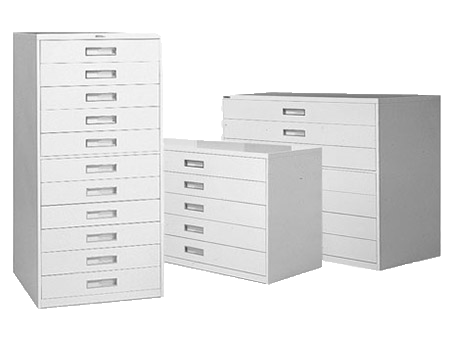 With minimal movement, the system provides complete access to all of the drawers. The closed design of the system offers a clean look to your storage, and at the same time provides protection against dust, light, and sprinklers. For added security, the cabinets also come with an optional security lock. In addition to media storage cabinets, we offer a wide range of high-density mobile storage and metal shelving for larger media storage needs. To find out which solution may be right for you, contact Spacesaver Intermountain.